Theobromine is a bitter alkaloid that acts as a vasodilator, heart stimulant and diuretic in the human body. The richest natural source of theobromine is cocoa, but the amount of theobromine in cocoa powder varies greatly. Some tested cocoa powders contained just 2% theobromine, while others have up toward 10% theobromine content. Just like theophylline and caffeine, theobromine is a xanthine alkaloid. On the human nervous system, theobromine has a similar – but much milder – effect as the one produced by caffeine. It is a lesser homologue to caffeine. This alkaloid was discovered in 1841 by the Russian chemist Alexander Voskresensky. The name theobromine is derived from Theobroma + ine. The suffix -ine is the suffix typically given to alkaloids. 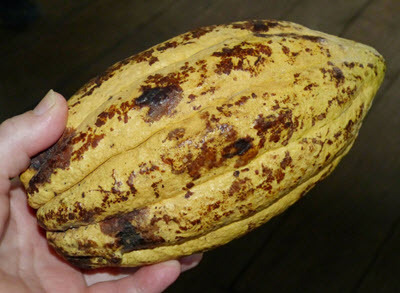 Theobroma is the name of the genus to which the cacao tree belongs, and this name means “food of the gods”. In Greek, theo means god and broma food. So, does theobromine contain any bromine, the chemical element with the atomic number 35? No, there is absolutely no bromine in theobromine. It is just a coincidence that theobromine is found in cacao (genus Theobroma) and is an alkaloid (thus getting the suffix -ine). The chemical formula is C7H8N4O2. Theobromine is a crystalline, bitter powder that is slightly water-soluble (330 mg/L). In its pure state, it is white or colourless, but theobromine in the trade is often a bit yellowish. Most people know that theobromine is present in cacao beans, but there are actually quite a few other natural products that also contain this compound, although in lower concentrations. Theobromine is for instance present in the leaves of the tea plant (Camellia sinensis) and in the fruits of the kola trees (genus Cola). On average, a cocoa bean will contain 1% theobromine. 1 ounce (28 grams) of dark chocolate will on average contain around 200 milligrams of theobromine, but the exact number for a specific chocolate bar can vary a lot depending on the cocoa used and the exact degree of cocoa in the chocolate. As mentioned above, theobromine is similar to caffeine, but has a milder effect on the human nervous system. Theobromine is weaker both in its inhibition of cyclic nucleotide phosphodiesterases and its antagonism of adenosine receptors. It is also a non-selective adenosine receptor antagonist. Theobromine is present in many different dieting supplements. Theobromine is usually used as a replacement for Caffeine. Theobromine does, unlike caffeine, not cause problems sleeping. An example of this is the popular diet supplement Burn X5. Burn X5 is available both as a caffeine and as a theobromine based supplement. In the human body, the liver metabolizes caffeine into three primary metabolites: paraxanthine (84%), theobromine (12%), and theophylline (4%). This means that you can have theobromine in your body even if you don’t eat cacao or any other products that contain theobromine. If you ingest caffeine, and your liver is doing its job right, you will eventually contain some theobromine.